Happy Anniversary to one of the most popular books of all time. To think it was published 201 years ago today and still readers everywhere cannot get enough of the story and its characters. What an amazing accomplishment. When Jane Austen called it 'her darling child', little did she know how it would become such to so many others as well. Wouldn't it have been wonderful if she could have known the impact it would have on the world - it and the rest of her works? Thank you, Jane Austen, for sharing your talents, your wit and your timeless characters to be enjoyed for centuries. 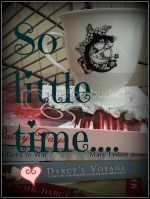 In celebration of this anniversary, I am hosting a giveaway, my tribute to Jane Austen and Pride and Prejudice. Please have your share in the conversation to be entered. Let me know your choice from the following should you be one of the randomly selected winners. (six winners, in all) Giveaway ends at midnight, February 2, 2014. Here is to many more years of happy reading about the love and lives of Elizabeth Bennet and Fitzwilliam Darcy. Thanks, Jakki, and good luck! I'm glad you stopped by. Thanks, Sophie. I'm so glad you popped in. I still love to hear how much you like them! :) It is international so good luck! P &P as it also happens to be my birthday! Thanks for coming by. Happy Birthday, to you too! Should you win, the calendar is yours. Last year's celebration is more well known and I hope this year's will be as well. I almost forgot about this until your post come out in my feed. Happy birthday to my favourite novel, P&P. Thanks for hosting this giveaway, Janet. I hope to win the mouse pad or compact mirror. Your designs are lovely too. You are welcome. I'm happy you came by and commented. Thanks for you lovely compliment. Great giveaway. I wish so badly that Jane Austen could know how her work has changed lives. I also wish she could have enjoyed the money that her books have made. She could have been truly independent. I love all the items but my first choice would be the compact and then the calendar. Thanks for loving Jane. I wish that she could have known too. She has changed many lives and that is a wonderful legacy. There are many of us that love and I am happy to be among them. Glad you are too! What a lovely giveaway!!! I like all the items! I wish Jane Austen can see us and the importance Pride and Prejudice has in our life! Thank you and thanks for visiting! I wish she could see it too. Do you think she would be quite amused? I feel the same, Julisa! Thanks for coming by and good luck. You have such lovely products, Janet. 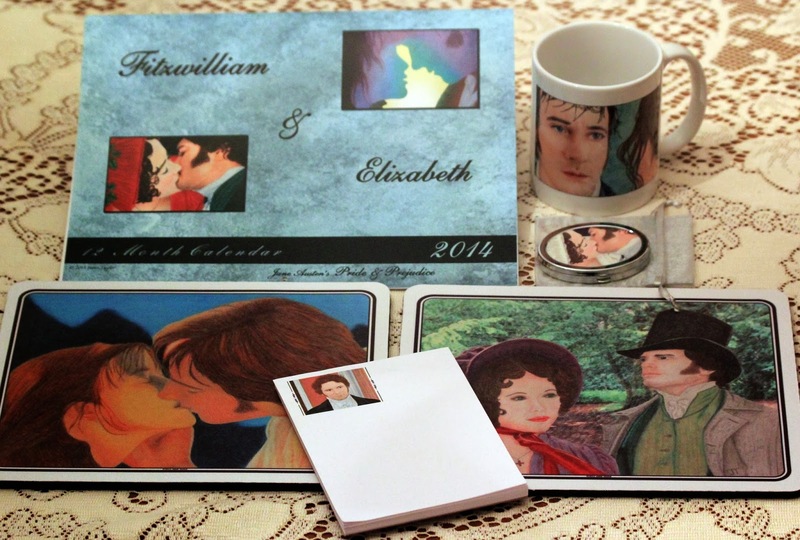 Thank you for the giveaway and I would love to have the 2014 calendar or the rejected mug. It is so important to celebrate the birthday of P&P and you are so right - we can never get enough. Hi Eva. Thanks for taking the time to visit and comment. I am happy that you like the products. You are entered in the giveaway and I have noted your choice. Happy 201 P&P! Thanks for celebrating with a giveaway of your wonderful art items, Janet. If I were to win, I'd be interested in the calendar or the mug. Thanks for the giveaway opportunity. Thanks, Sophia Rose! Glad you stopped by and good luck to you. You are correct...no one knows better than we do what we want! I so happy that you love the things you got for yourself! That makes my day! Very excited about this giveaway, Janet. Except I'm one of those strange people who won't actually use the note pad because I don't want to wreck it by writing on it! I'm happy to see you here, Suzan. Thanks for stopping by! I have been known to do some strange things like that myself! Good luck with the giveaway. By the way, I'm sure enjoying my lovely bracelet. I feel special every time I wear it! Well if I am one of the lucky winners, I would love the mouse pad with Jennifer Ehle and Colin Firth. Happy 201 Birthday Pride and prejudice. It is so good to hear from you, Mai! Thanks for coming by and chatting! I agree with you on your favorites and their order. The only thing I missed was the Jane Austen Festival and meeting those two in real person. Wish I could have been there for that too. I will never forget the tour and the wonderful memories. It was great meeting you and hope we meet up again some day too. I have you down for the mouse pad with JE and CF should you be one of the winners. Thanks again for stopping by. Love and best wishes to you as well. Janet, your work is absolutely gorgeous! You are one talented lady! I would love to win any of these lovely pieces but since you asked us to choose...I would love to win the calendar! Thank you for the giveaway!! Thank you, Kelli. That makes it all worthwhile! I hope you get the chance to have the calendar! Such a wonderful celebration! And your prizes are beautiful! I am already enjoying the calendar I won. It would be fun to win the compact to carry around with me. Happy you stopped in to celebrate with us and that you are enjoying your calendar! Good lucky winning the compact! I like the point at which you capture some of the poses (even if you're adjusted time a wee bit to get them like that! ), particularly in "A Walk in the Woods." It's a great snapshot. Somewhere on your site you should consider showing the art you've done for authors' covers (if that's done--is it?). You've done such great work for Linda and I, and now Jan, and it would be nice for you to show it off. I already have ideas for my next Regency for you, and I haven't even completed writing it yet! Thank you, Suzan. I appreciate your comments about the poses. Great idea about a place for the covers. I think I might add a page just for them. That would be fun and good for the books too. I'll see if I can't get it done in the next few days. I'll let you know when it is. That you would consider me for your next cover after having done the first, is the ultimate compliment. That means a lot to me as do your words about the covers. Thank you. I'm excited that you are working on a new book. I know it will be good and I look forward to reading it. What a great giveaway, Janet! Don't enter me because you know my house is overflowing with your wonderful products (LOL), but I had to add my voice to the celebration of Jane Austen's P&P! It's changed my life in so many ways. I also think Suzan has a great idea for you to show the fantastic covers you've done for authors! Thanks, Jan. I'm so glad that you stopped by and added your voice! Isn't it amazing how much her works have changed so many lives, mine included. Thank you for reintroducing me to her, her books and especially, P&P.